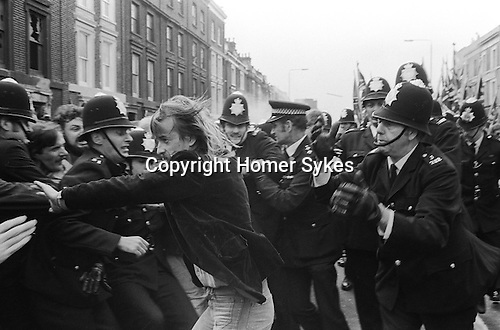 A left wing demonstrator tries to break through a police cordon at an anti National Front march. Lewisham, south London 1977. Robert Johnson from Sydenham, south east London bursts through a police cordon to confront National Front supporters protected behind police lines. Moments earlier he had been pinned down by four policeman, in the confusion he managed to escape their grip, knocking one of the policeman's helmet to a jaunty angle. The crowd moved in behind him and he miraculously escapes arrest.